Miniature Acrylic Paintings - Palate knife on canvas - Gallery wrapped edges with artwork extending to the sides 1.5 " deep. Original 12X 24 Framed Acrylic on Canvas $1800. The summer and winter solstices are in balance as a Yin and Yang design with the burst of lights from the center crystals. 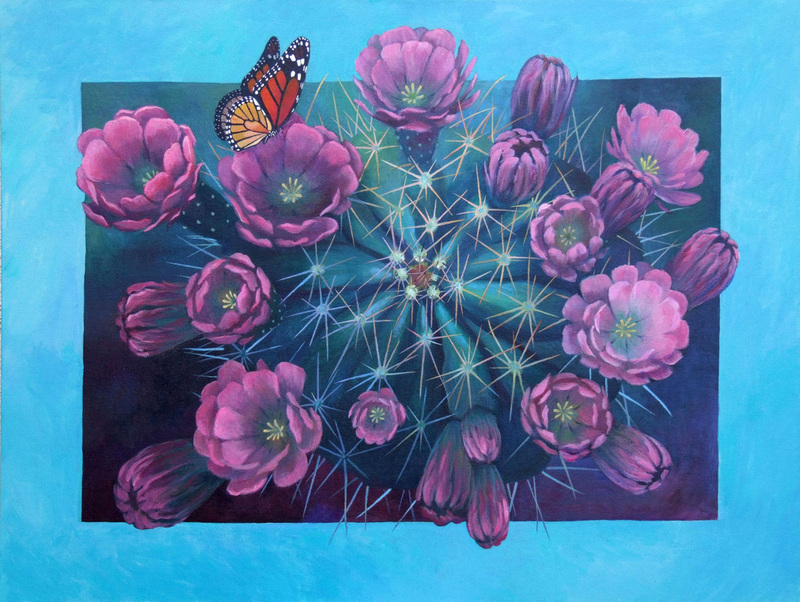 The painting is wired to hang four different directions as a horizontal or vertical painting. Santa embodies the Spirit of Giving. Nicholas was a devout Christian and the baby Jesus was God’s gift to mankind and thus Santa’s First Gift. 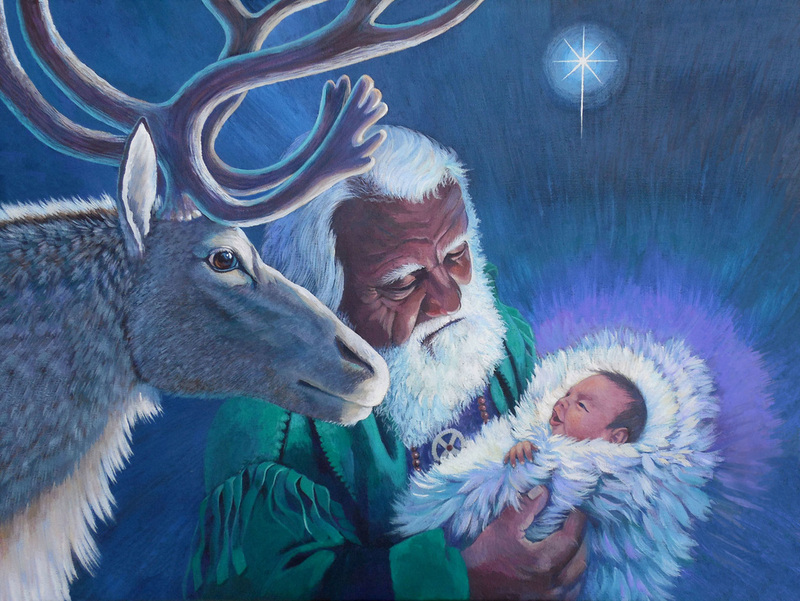 Shown here is a combination of the Santa story complete with reindeer as they admire Jesus, the reason for the season. The Star of Bethlehem shows the way. Nicholas, who was born during the third century in a small village at the South end of Turkey, was raised to be a devout Christian. While Nicholas was a young boy, his wealthy parents, died in an epidemic. He sold his inheritance and gave his money and possessions to the poor. He dedicated his life to the service of God. As a young man he became Bishop and was known for his generosity and love of children. 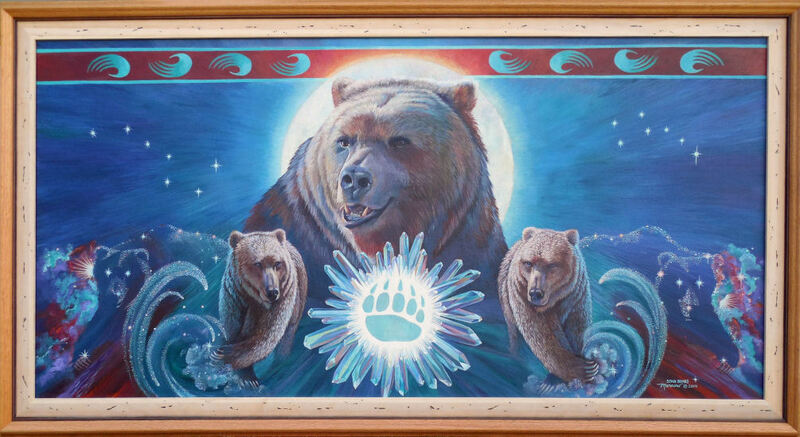 24 x 48 Framed $5500. 12 x 16 Framed $1500. 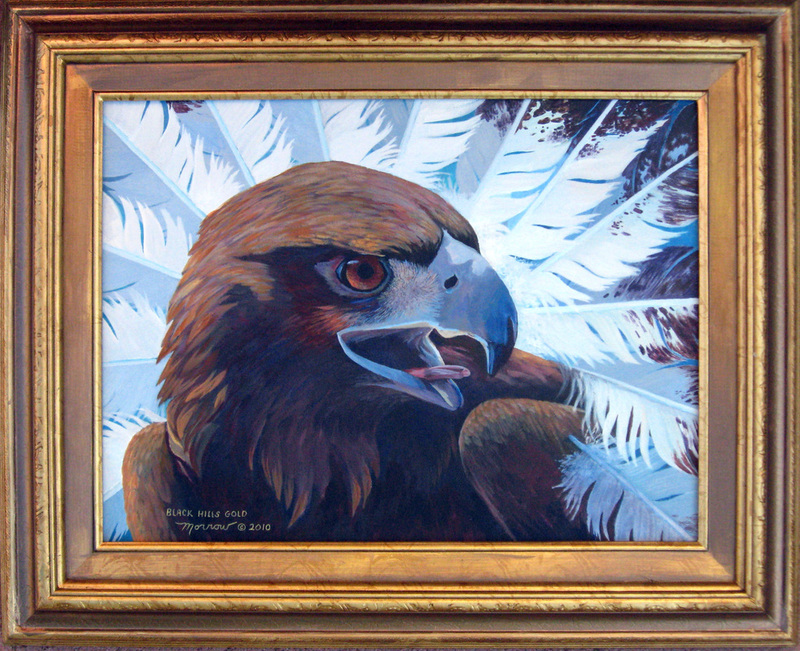 The Golden Eagle is a majestic bird. I had an opportunity to watch a bird that was being rehabilitated. Her handler was teaching her to hunt using Falconry techniques. He had a portion of a rabbit and showed her the game. She was on the ground and took flight when she saw the game. She soared high in a spiral above us. I was in position with my camera pointed up as the bird began her stoop. Dropping like a rock and screaming she went straight for the rabbit and I didn't get the picture as I was in too much awe to take it. 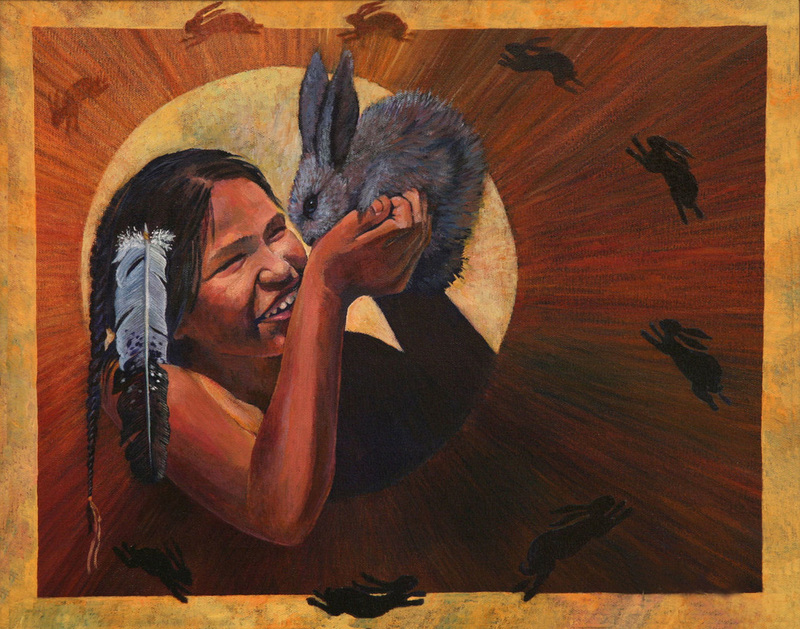 She grabbed the rabbit and went to a high rock to enjoy her meal. Believe me, I remember it clearly to this day as I can even hear her piercing scream in that dramatic dive. 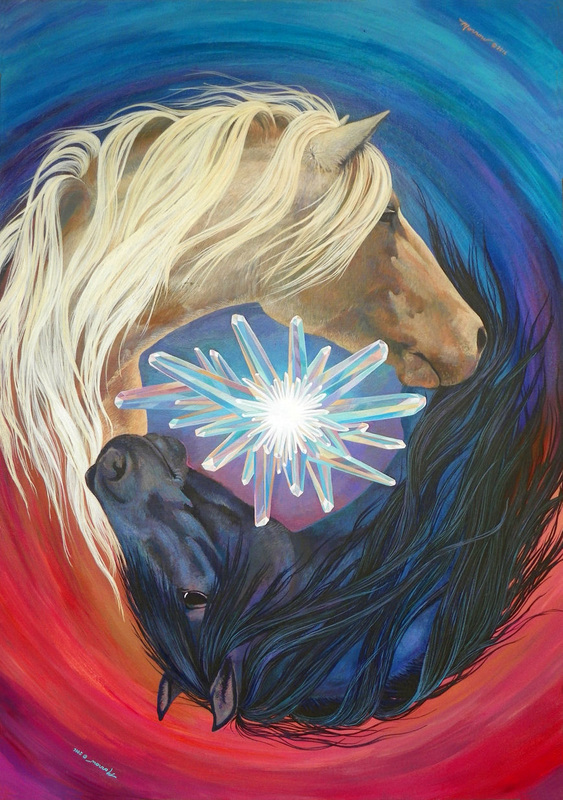 The painting is part of a set pairing with Apache Spirit Pony. An Apache Burden Basket from the artists, personal collection is included. 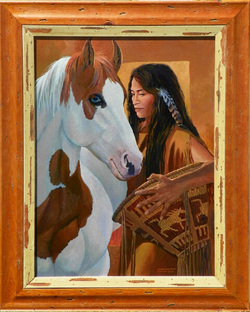 The Original pony is paired with Kathy Morrow's original Trail of painted ponies form, Apache Spirit Pony 6" x 9". 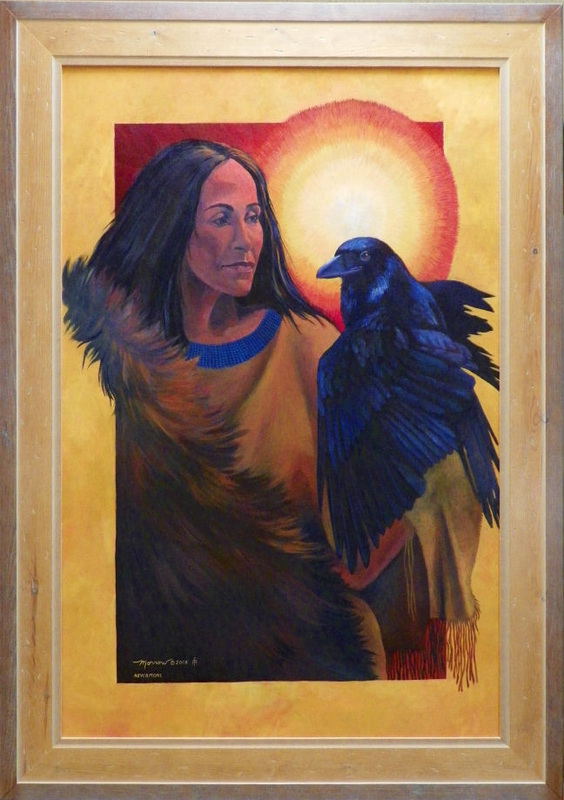 My sister Veronica is the model for this painting. She is Apache and Dine (Navajo) Our parents adopted her when she was 9 years old. She has inspired many of my paintings and those of other artists. you will see her face on many Lean'in Tree Cards. The original Acrylic painting on canvas, Old Friends was inspired by my friend Chief David Bald Eagle of the Lakota tribe and his American Paint Horse named "Chief". David has trained Chief to respond to the traditional war bridal used by the Plains Indians that is a loop going around the lower jaw. Much of the control of the horses movements is done by the pressures of the riders body to communicate with the horse Chief follows David whenever he goes outside like a puppy. They have been friends for a long time and Old Friends . seemed like the right name. David was born in 1918 and his grandfather White Bull was in the Battle of the Little Big Horn. 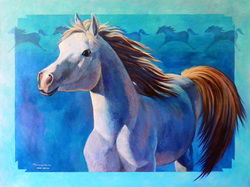 I have created a Trail of Painted Ponies form that goes with the painting Old Friends, it is called The Chief Pony. Chief is wearing a sculptured replica of one of David Bald Eagles, full length eagle feather bonnets. 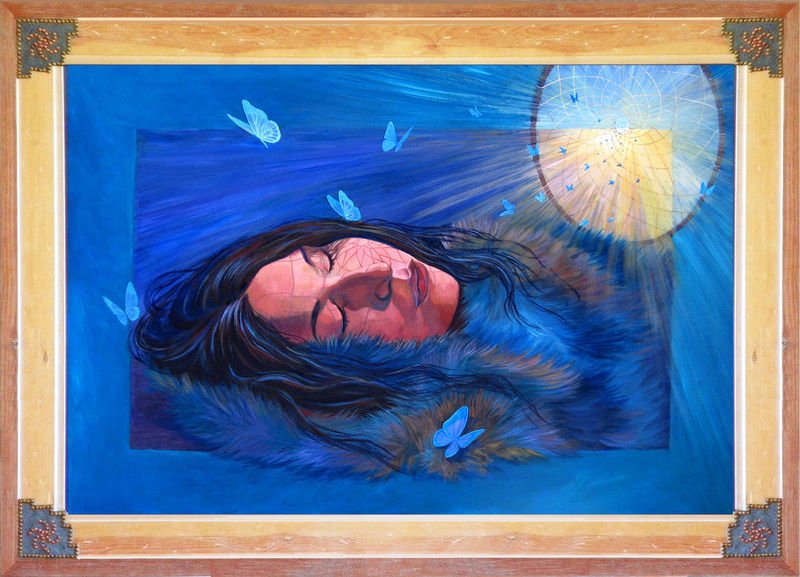 Dream Catcher 24 x 36 Framed with custom leather and brass corner insets designed by the artist. 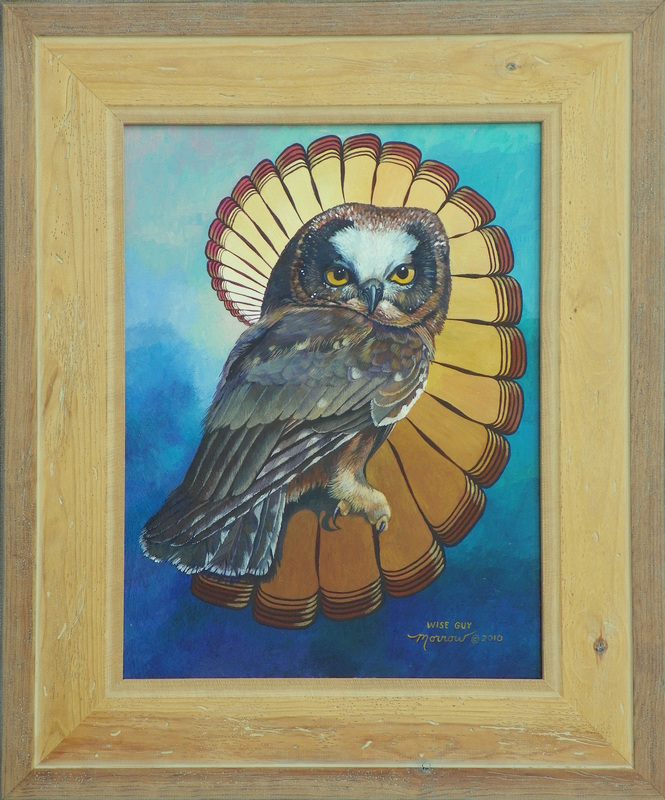 The Saw Whet Owl is from the Wildlife Center in New Mexico. 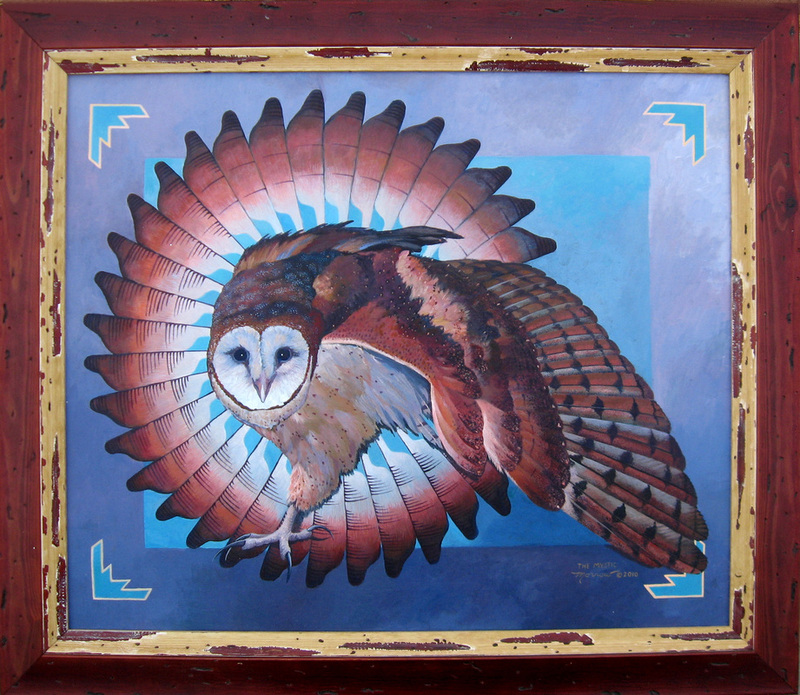 The non profit organization started working primarily with Raptors and has expanded to wildlife in general after wildfires in Northern New Mexico brought in many orphaned and injured animals. A Broad Tail Hummer has struck gold in the heart of a Prickly Pear cactus. Prickly Pear grow around our house in New Mexico. The beautiful Yellow and gold flowers attract many hummingbirds and the most common in our area are the Broad Tail Hummers. We maintain feeders so that I can get good photos of these little aerial acrobats. 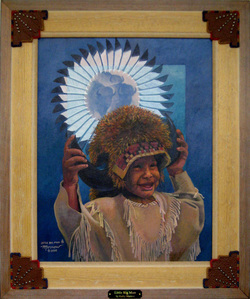 Native Americans often refer to them as the littlest warriors as they seem to fear nothing. 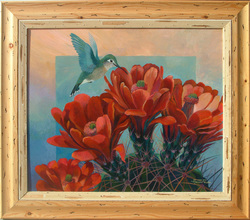 Many of my hummingbird paintings involve cacti. I use the cactus from around my house and in the desert behind my house. I have a feeder outside my window and have plenty of models for my hummers . Our most common species of hummingbirds in the Las Cruces area are the Broad Tail, Black Chinned and Rufus. Many times I will work a medallion into the sky as a sun or moon sometimes with a hummingbird design in painted bead work. 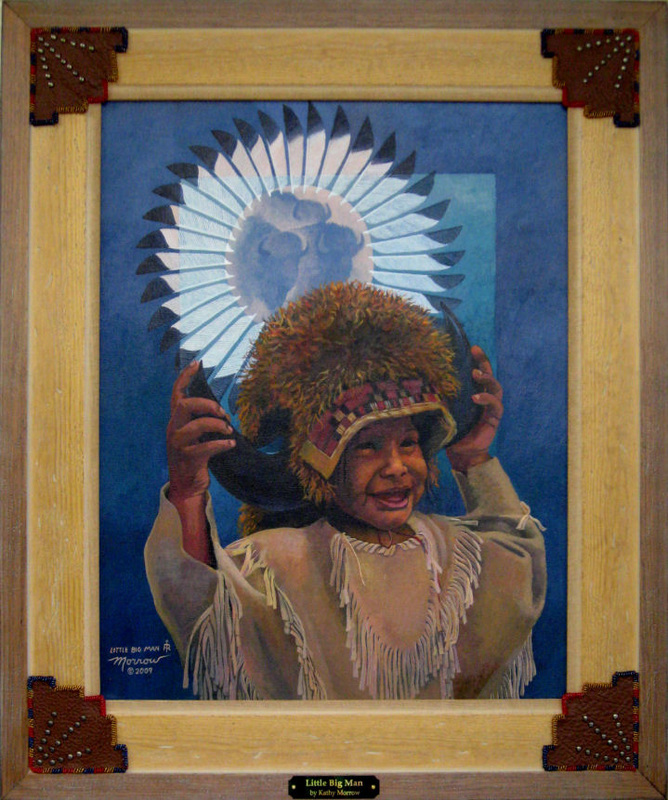 Eugene Little was 4 years old in this painting and was trying on his fathers buffalo horns and cape. It's too big for him and he has to hold the horns up. As we watch how fast children grow, we know it won't be long until he is a young man. His mother, Gloria Little, made the buckskin shirt he is wearing and designs and makes beautiful traditional leather garments. Buffalo Soldier, Don Parish is talking to Chief David Bald Eagle. David is making the sign of "Buffalo" with his hands. Don is a Buffalo Soldier Impressionist and does professional presentation of the history of the Buffalo Soldiers. 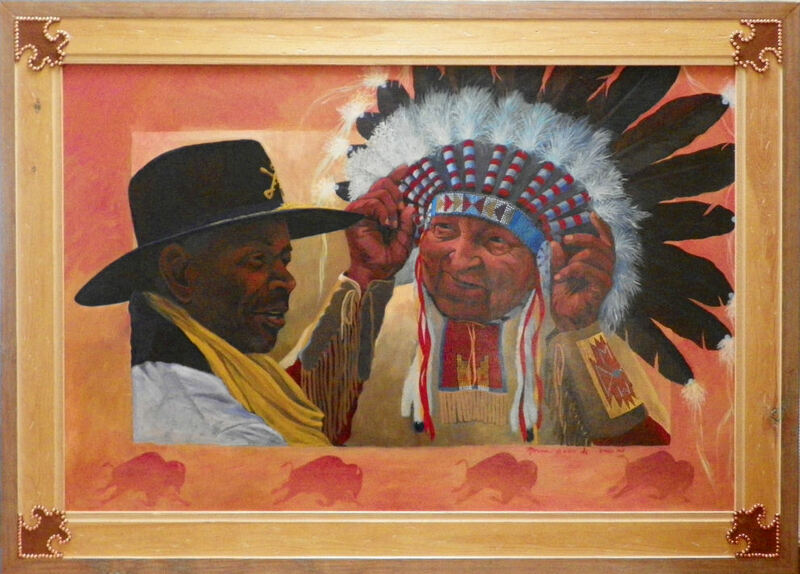 Don as been a helpful adviser for this painting and several others of the only female Buffalo Soldier, Cathy Williams. If you with to contact Don about historical presentation email him a ibbadbuffalosoldier@cox.net or call (469) 348-4880(469) 348-4880. 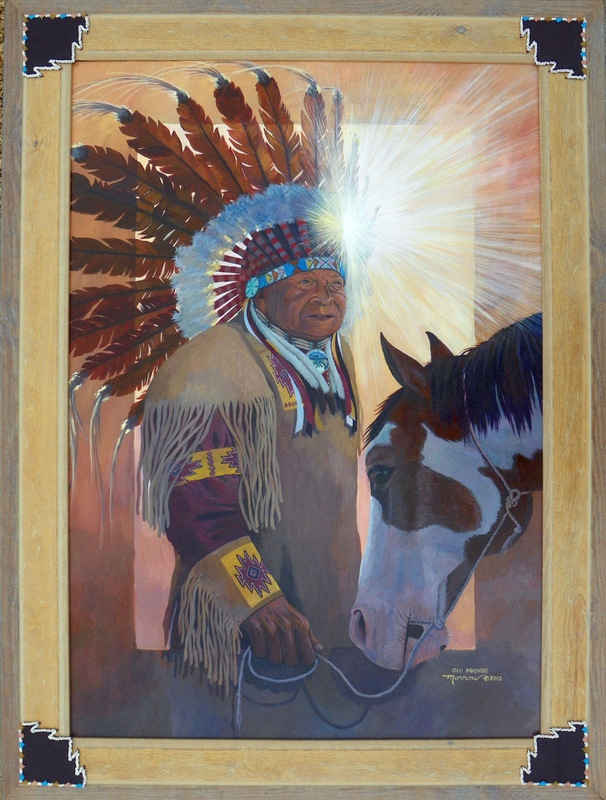 I have been making paintings of Chief Bald Eagle and his family for almost 30 years. his is an honored Chief of the Lakota Nation and has appeared with speaking roles in many films such as Into the West, a mini series by Steven Spielberg. The Red Tail Hawk is flying through a moving vortex. 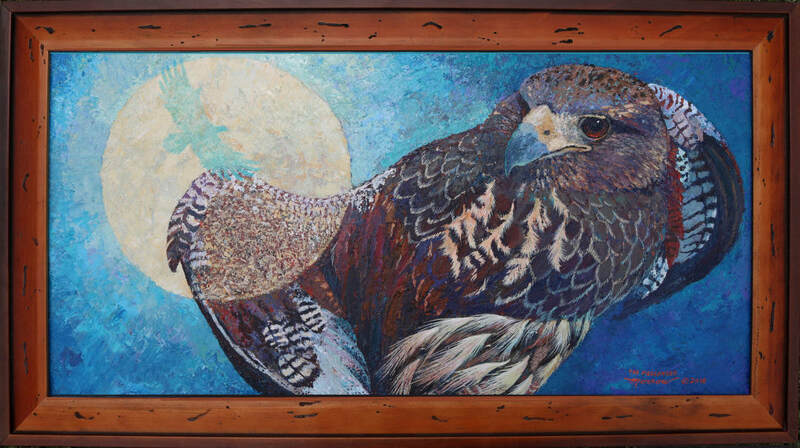 I love playing with optical illusions and Sky Hawk is painted with a careful balance of medium, dark and light tones. The background design is painted in a way that creates an illusion of movement. By focusing only on the hawk you will begin to see the background rotate slowly counter clockwise. 5 % of the population are not able to see this illusion and there is no known reason why some don't see it. Once you do see the movement, you will always see it when you look at the painting.